Fido just leaped for a frisbee, and now he’s limping. What’s wrong with him? Do I need to take him to the vet? How much will it cost? This is why pet insurance is so critical. In a time of panic, you should be worrying about the health of your dog, not the number in your bank account. We rate the biggest names in the pet health insurance industry based on our own research and provide you with a summary of what each company offers, as well as pros and cons for each. Feel free to click on the “Read Review” text below the company name in the table below to go straight to its review. Our coverage comparison is relatively straightforward, but pricing comparisons can get complicated. Why? Pricing quotes are unique because they’re based on each pet’s age, breed, geographic location and several other factors. For this reason, we encourage you to get quotes from multiple companies before deciding on a pet insurance provider. We’ve made this easy for you by creating a quote widget that will pull price quotes from top pet insurance companies when you fill out one short form with your pet’s details. These links open comparison tables in a new window so you can compare coverage and estimated costs side-by-side as you research company reviews. If you’re unsure where to start, be sure to read our beginner’s dog insurance guide. Healthy Paws continues to impress us with its unlimited benefits with no per-incident, annual or lifetime caps. This company also has far fewer coverage exclusions compared to many competitors, so it appears that Healthy Paws is less likely to deny your claim. You can also customize your out-of-pocket expense risk by adjusting your policy’s reimbursement rate (70%, 80% or 90%) and deductible ($100, $250, $500 or $750) when you sign up. There are some restrictions on the reimbursement and annual deductible amounts for pets, depending on the age when they’re enrolled. Healthy Paws has excellent customer service reviews. Check out the comment section in our Healthy Paws individual review. It’s filled with real customer accounts. What’s missing with Healthy Paws? It doesn’t offer a wellness plan to cover annual vet visits, which is an increasingly popular feature among pet parents. Overall, we think Healthy Paws is the best-bet for pet insurance. It has some of the best coverage and at one of the least expensive monthly premiums. If you do run into any hiccups, we’re sure you’ll get the help you need with its excellent customer service. Excludes hip dysplasia in animals enrolled after age 6. There is also a 12 month waiting period. Pets Best has stepped it up with the items it covers in addition to its low-priced “Accident-Only Plan.” This unique policy allows you to insure against unexpected pet emergencies without charging you monthly for the lower priced (vet exams) or less-likely costs (rehab, chiropractic and acupuncture care). 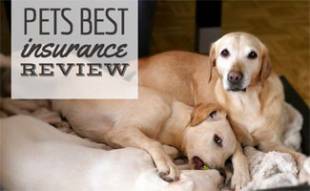 Pets Best was consistently among the least expensive pet insurance companies when we ran quotes. We’re also impressed with its average claim repayment of 5 days, and it has a 24/7 Pet Helpline, which allows you to speak with a vet expert any time of day. 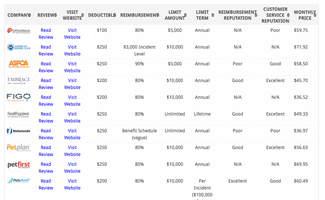 Its deductibles range from $50 to $1,000, and it offers 2 wellness plans from which to choose. You can truly customize your coverage with Pets Best. Pets Best doesn’t require an exam to set your pet’s health baseline (something Healthy Paws requires). What kept it from being #1? Pets Best has one of the same underwriters (American Pet Insurance Company or APIC) as Trupanion (another pet insurance company), which is unrated by A.M. Best. We consider this a higher risk factor vs. those who are rated. However, we can’t dispute Pets Best’s low prices and excellent coverage, which is why we feel it deserves a spot in our top 3. Figo is the newest pet insurance company in our comparison. We’re impressed with its coverage details, and it’s the only company in our comparison to offer a 100% reimbursement option. You can submit claims through the app, fax, email or mail. Should you run into any issues, you can reach Figo by phone, text, live chat, email, fax, Facebook Messenger or Twitter. Its waiting periods are comparable to competitors, although anything regarding the knees has a 6-month waiting period (many others have shorter waiting periods). It’s not common for a newcomer to enter our top 3 its first year in our reviews, so it speaks volumes that Figo has come out so strong. It has some of the lowest prices, comparable to companies that have been around much longer. Covers advertising lost pets, canceled vacation due to pet illness, etc. Our readers have access to an exclusive 5% off a new FIGO pet insurance policy, just use this link to get started. The companies listed below did not make our top three rankings, but we’ve reviewed them in case you want to learn more. Every pet and every situation is different. You might find an excellent fit for your family below. Note: We’ve excluded companies with less than 5 full years of nationwide business experience from this ranking so we can provide reliable recommendations. 24PetWatch, founded in 2000, offers pet insurance for dogs as long as you enroll them before the age of 10 years old. In the quotes we ran, 24PetWatch was consistently among the more expensive options. It also doesn’t offer unlimited claims as an option, which is a feature we’ve come to expect from pet insurance providers. However, one cool thing 24PetWatch does is to provide coverage for chronic conditions if your pet has gone 24 months symptom-free. This is not standard for pet insurance providers. If one leg has a CCL (ACL) injury before enrollment, the other leg will not be covered even if there are no prior issues. It’s considered a pre-existing condition. There are no active 24PetWatch coupon codes at this time. AKC Pet Insurance, a PetPartners brand founded in 2003, doesn’t require vet records or an exam prior to enrollment. It has strict age restrictions and requires an additional fee for coverage of hereditary and congenital conditions, which we expect the average pet insurance plan to include. It has more limitations compared to other pet insurance providers and only covers hip dysplasia for dogs enrolled prior to their second birthday. For all of these reasons, AKC is not in our top 3. Unfortunately, when looking through the overall features of ASPCA and Hartville pet insurance, we cannot highly recommend either brand. It’s important to note that C&F Insurance Agency, the administrators of the ASPCA Pet Health Insurance program, pays a royalty fee to the ASPCA for the use of its mark through a licensing agreement. C&F Insurance Agency also administers Hartville, which has an identical offering to that of ASPCA pet insurance but is not affiliated with the ASPCA organization. The company, founded in 1997, has a history of low reimbursements, even under its highest cost plan. There are no active ASPCA Pet Health Insurance coupon codes at this time. Embrace has great customer support options and a rather good reputation overall. When it comes to monthly premiums, Embrace can be all over the board, so we recommend getting an individual quote for your pet. Regarding claims, Embrace says it averages 5 business days and pays 40% within 2 business days. Embrace tends to fall a little behind on technology for claims submissions versus the top players in this field. Tip: If you have USAA, you can get a discount with Embrace. If one leg has a CCL (ACL) injury prior to enrollment, the other leg will not be covered even if there are no prior issues. It’s considered a pre-existing condition. Embrace offers a few different discount options. Spayed or neutered pets get a 5% discount. if you have multiple pets, each one gets 5% off. You can also pay annually and get 5% off. Click here to access any of these discounts. Nationwide Insurance (previously VPI) is one of the most well-known dog health insurance companies. VPI was founded in 1982, and Nationwide acquired and started selling VPI’s pet insurance product in 2015. The Whole Pet and Whole Pet with Wellness plans are like most pet insurance companies, reimbursing a percentage of your vet bill for covered treatments. In the past, it only offered what it now calls its Major Medical policy, which uses a standard list of prices to determine payback prices for procedures and covered items, regardless of what your vet actually charges you. Major Medical is a cheaper option than the Whole Pet plans. Nationwide is among the most expensive, and it doesn’t have a reputation for timely reimbursements despite the ability to track claims in real-time online. Unfortunately, Nationwide has a track record of poor customer service and quietly raising monthly premium rates as pets age. There are no active Nationwide Pet Insurance coupon codes at this time. PetFirst was founded in 2004. Even though it has been in business for more than a decade, there are not a ton of reviews out there for us to share. It has a short waiting period for accidents (only one day after enrollment). Other than that, there’s not much that stands out about PetFirst. We suggest you request a quote and read a sample policy to see if PetFirst is a good fit for you and your pup. When we ran our quotes, PetFirst was consistently among the most expensive. If one leg has a CCL (ACL) injury prior to enrollment the other leg will not be covered, even if there are no prior issues. It’s considered a pre-existing condition. There are not any active PetFirst coupon codes at this time. Petplan offers unlimited annual coverage but the main thing keeping it from our top spots is its higher prices for similar coverage. The quotes we ran indicate that in most cases you can get unlimited annual coverage from Healthy Paws, Pets Best and Figo for a less expensive monthly premium. However, we still think Petplan offers some of the best coverage and is worth getting a quote from to see if it works for you. Petplan has a great claim repayment reputation and allows 30 days for claim repayment but averages 5-7 days. The company covers exam fees and has a shorter waiting period for hip dysplasia at only 15 days. In addition, Petplan’s policy has coverage for travel cancellations due to life-threatening pet injury or illness, as well as coverage for advertising expenses related to a lost pet. In some cases, it even offers reimbursement for the cost of your pet if they’re never found. Petplan offers discounts on your premiums if you don’t file a claim for a period of time, rewarding you for keeping your pet safe and healthy. It has an annual coverage limit of $2,500 to unlimited, annual deductibles of $250 to $1,000 and 70%, 80% or 90% reimbursement rates. There may be even more options available to you through the call center at this number: 800-237-1123 (our exclusive 5% discount will be honored for this phone call as well). Covers advertising lost pets, losing your pet, canceled vacation due to pet illness, etc. Dogs must have annual health and dental checkups to qualify for coverage. Failure to do so may mean your dog won’t get insurance coverage until that checkup is done. Use coupon code CanineJournal to receive an additional 5% discount (10% total if you sign up online). Alternatively, if you call 800-237-1123 you will automatically get the additional 5% discount! You can also visit our dedicated Petplan promotions page to discuss current offers. Trupanion’s deductibles are per condition and lifetime, meaning that once it’s paid, you never pay the deductible again for that condition. However, it also means that if your pet is sick or injured multiple times in one year, you may be paying a lot in deductibles. Trupanion is on the expensive side for similar coverage compared to our top 3 picks in the quotes we ran. There are not any active Trupanion coupon codes at this time. Dogs are quick and sneaky, and there are times when they get into trouble when you turn your back. That’s exactly what Atlas did, but fortunately, his parents had dog insurance for him. Atlas was able to get the care he needed, and his parents didn’t go broke. Your biggest concern as a pet parent should be the reputation of a pet insurance provider as offering the coverage you need at a price you can afford. Getting a pet insurance policy is useless if it doesn’t cover what you expect it to cover or if you can’t afford the monthly premium. Remember, although cost is important, it’s not the most crucial factor. Your pet’s protection and coverage in the case of an emergency is your number one priority so be sure to make your decision with the long term in mind. After you narrow your search down based on these requirements, the next step is to decide what type of coverage you want for your dog and which additional perks may be negotiable to lower your costs. If you’d like to learn more about terms you should know regarding insurance for dogs, reference our terminology info. Picking a pet insurance plan is a personal choice, and no one knows what your dog needs better than you. Take the time to make an informed decision, and know that in the long run, it’ll be worth having the added protection. Check out our pet insurance winner’s guide for more on our top 3, and don’t hesitate to ask questions in the comments below. Which factor is most important to you when choosing a pet insurance company? Hi Kimberly, I’m researching insurance for my 6-month yorkie and narrowed down my choices to Healthy Paws (based on their excellent customer ratings and reasonable premiums) and Petplan. I was ultimately leaning towards Petplan because of its exam fee coverage and the relatively comprehensive dental coverage (since Yorkies are known for their dental issues) whereas Healthy Paws offered neither. Then I came across this article from NBC News about premium increases throughout pets’ lives and was blown away by the projected increase in Petplan’s premiums. Now I feel I’m back to square one. I know how difficult it is to switch insurance companies in the middle (pre-existing conditions, etc.) so I want to get it right the first time. Your analysis in this article is extremely helpful, but any further insight would be extremely helpful. Thanks!! You have definitely done your research, good job! From how I’m interpreting the article, it’s referencing signing a dog up as a puppy as well as a later age in life, not necessarily what you’ll be paying during those later years if you’ve been a steady customer with coverage for your dog during the pup stages too. If you sign a puppy up for coverage your rates will still increase throughout the dog’s life, but they shouldn’t be as high as they would be if you waited to sign up for coverage until the dog was 8-years-old. For example, if you sign your 6-month-old dog up today and it costs $30/month, by the time the dog is 8-years-old you may be paying $60/month. However, if you waited to sign your dog up until it reached its 8th birthday, you may pay $100/month. That is partially because dogs are more of a liability the later they are insured in life because the pet insurance company doesn’t know the full history of the dog as a puppy through adult life. Additionally, pet insurance companies try to incentivize an early sign up for pet insurance by offering lower rates for those who maintain steady coverage throughout a dog’s life. Does that make sense? So while the article is correct, in stating that insuring a dog later in life is more expensive, it is often more affordable if you sign your dog up as a puppy (the rate will typically not be as high in those later years). Unfortunately, we can’t predict how your rates will increase with either company. All companies raise their premiums as the dog ages due to various reasons (e.g., vet care costs increasing, dog aging, etc.). Speaking from my experience moderating comments at Canine Journal, we seem to get more negative feedback from Petplan than Healthy Paws in terms of cost. However, as you mentioned, Petplan has more thorough dental coverage and covers exam fees. Neither company covers dental cleanings, but they both cover a portion of non-routine dental treatments. We have a Healthy Paws vs Petplan article that may be helpful for you. Additionally, our Yorkshire Terrier article mentions common health concerns including: retinal dysplasia, Legg-Calve-Perthes disease (thigh bone degeneration), luxating patella (kneecap dislocation), collapsed trachea and portosystemic shunt (a liver condition). The breed can live 14-16 years, so as you mentioned, it’s important to get coverage in the beginning and stick with it to avoid any pre-existing conditions not being covered. I hope everything I said made sense. We get a lot of great feedback about Healthy Paws from our readers, which is why it’s our #1 pick for pet insurance. However, Petplan has some of the most thorough coverage. If monthly premium cost is more of a concern to you, Healthy Paws may give you the lower price. If you want more thorough coverage, Petplan may be your company. Let me know if you have any further questions, I’d be happy to discuss more with you and help you get the coverage you are looking for! Pet insurance in general is known to be a gamble, but Nationwide has perfected the claim denial game. I am a physician, so I know a thing or two about medicine and can speak the language. Our Boston came to us with diarrhea when he was about two years old. At age 6, he went through a spell of not eating and lost some weight. He never got a formal diagnosis from the vet, and eventually just started eating normally again. We filed a claim and it was denied due to “pre-existing condition.” They said his anorexia was the SAME as his diarrhea years earlier. Then they went so far as to provide a long list of vague and general “diagnoses” that they would never cover in his lifetime. I repeatedly asked them for medical evidence to support their assertions that his transient condition had anything to do with the long list of “conditions” they were refusing to cover in the future. Needless to say, we’ve cancelled our policy and are giving another company a try. Hi. I am looking for Pet Insurance for my 2 year old pure bred standard poodle. He is healthy & happy. He had a slight seizure which I think is a side effect of flea medication. What would be the best insurance for us? I had VPI (which is now Nationwide) w/my previous dogs. I had a good experience with them. They covered well visits and one of the dog’s epilepsy. If this is a condition, which company will cover? Great question! We suggest getting quotes from our top ranked pet insurance companies to see how much each will cost you. Since your dog has already had a seizure, pet insurance companies may not cover epilepsy since they may deem this a pre-existing condition. We recommend Healthy Paws for the best coverage and price. However, Healthy Paws does not cover wellness visits, so Pets Best may be more in line with what you want. If you’d like to share more with us about what you want covered and other features, we can try to cater to that and see if another company may be a better fit. Buyer beware! Petplan interprets “pre-existing” conditions to include aspects that are often seen in normal, healthy animals. My dog had light tartar on her teeth, with NO indication of disease or problems, but that was the basis for denying a claim over 5 years later, involving a loose tooth, periodontal disease and the need for 8 extractions. Even the Amer. Vet Dental College says that tartar above the gumline does not cause periodontal disease. Even a year later after holding the policy, my dog had no evidence of dental or periodontal disease, yet the recent claim was denied because of a pre-existing condition. Company representatives say the policy does not require a medical condition to exist to be pre-existing, but merely a “clinical sign”- which they define as “changes in your pets normal healthy state”. No disease or medical condition, but it can preclude coverage 5 years later. Premiums have nearly doubled in the 5 years of coverage (now over $1500/year), even with only one small claim. Their ability phrase things in an oblique manner that nobody is likely to catch allows them to deny claims easily. That, on top of using terms in an unconventional way (e.g. a “clinical sign” does not mean that it is a sign of illness— merelly whatever they decide) leaves the buyer at tremendous risk. Unless you read the policy over with a fine tooth comb and know your animal has no indications of any problem at all before buying the policy, and as long as you don’t mind huge premium increases, this is not a good policy for you. My husband bought me a beautiful terrier, but the breeder mentioned to him that this terrier’s mother had a lot of health concerns. I would really like to look into pet insurance so I can provide for her if her health deteriorates. Your advice to read reviews so I can find a reputable pet insurance provider is really helpful. I am still having a hard time deciding on a company I have been back an forth With NationWide being pricey, while other like Embrace and Best Pet have been way lower in cost. So which is really the best that pays out without issue and not having to chase them to pay it? The one that has less issue and better service with customers all round? This breakdown is incredibly helpful–thank you. I saw in your full review of Healthy Paws that pets eight years and older are restricted to 60% reimbursement. Does Figo have age-related reimbursement restrictions? Great question, Jana! I just finished up our summer audit and we will be sending those results live within the next month hopefully. In regards to Figo, we implemented a new policy to not review companies that have fewer than 5 full years of history and experience (Figo was founded in 2013). We did this because in the past pet insurance companies have popped up with extremely low prices (convincing pet parents to sign up) and then after some time, hike up their prices because they have claims to pay out. This leaves customers in a difficult spot because if their pet has developed any health issues they now have pre-existing conditions, so switching insurance carriers may not be possible. We are not saying this is the case for Figo, but we are waiting to review them further until 2019. We feel 5 years gives companies enough time to establish consistent pricing and a reputation which helps us evaluate them in our rankings. In our updated reviews coming out this summer, you’ll notice Figo is not included in them because of this reason. If you are curious to learn more about Figo, I encourage you to reach out to their customer service. Let me know if you have any other pet insurance questions I can help you with! Figo raised our monthly premium significantly after the first year, even with no claims, from $40.72 to $56.08. The dog is only 3 years old. Same thing happened to me with my two year old dog. I think that when you write this in the future, you should take into account the rating on other sites such as yelp. For example, you give Trupanion an honorable mention, but it has a 2 star rating on yelp, and the reviews are horrific. Healthy Paws has a good rating there, but seems to be going downhill since they were acquired by a larger company last year. It would help to know percentage of denied claims, and annual premium rate increases. I was looking for a plan for my mixed breed manx kitten, but I’m really skeptical that these policies will cover genetic conditions despite their aggressive marketing. I’d be very interested to see a comparison to just putting $50 a month into a savings account. Thanks for the great input, Laura! Unfortunately, there isn’t a way for us to obtain the percentage of denied claims for each pet insurance provider. However, that would be a wonderful piece of information to share with our readers! As for annual premium rate increases, that’s tricky to share as well since it varies based on location and pet details. Fortunately, cats are often much less expensive to insure than dogs (often less than $20 per month). Have you gotten quotes for your mixed breed manx kitten? Instead of being limited to only having $3,000 in a savings account if an emergency arose for your kitten, you could have an unlimited amount available every year and paid around $20/month (totaling $1,200 in premiums for 5 years). Unfortunately, with the cost of vet care, $3,000 won’t stretch too far in 5 years. Testing, treatment, prescriptions and vet visits can add up quickly when you’re dealing with a sick pet. By investing in pet insurance, your ~$20/month can ensure your cat is covered for any minor and major illnesses including cancer, injuries, chronic conditions and more. I had my puppy on Trupanion but the lack of exam fees being covered was a deal breaker for me, as vets in our area typically charge $50 or more per visit. I did like the per incident deductible, but the premiums were really high even for $750 deductibles. Your #1 pick Healthy Paws has the same limitation. I hesitated to use Pets Best as their pricing goes up as dog the gets older, but I like that I have the flexibility to adjust deductible or pay out percentages to lower the cost as she gets older. So we are going to put her on Pets Best. Pet Plan was more expensive than Pets Best, and they had higher deductibles. Glad you found a company your feel comfortable with! As a heads up, all insurance companies increase prices as the pet ages and vet costs change. Thanks for sharing your thought process with us, hopefully it helps another reader in the future! Ive had Trupanion for my 2 dogs for 5 years. Each year the monthly rate has increased by a few dollars. Last month it went up $12, mind you I have NEVER made a claim, my dogs were just puppies when I enrolled them. I called inquiring about the substantial increase and they told me it was because of the age of my dogs, now 5 and 6 years old. I had to drop them at that. I’m now seeing that other pet insurance with more coverage is cheaper then what I’ve been paying. Lesson learned, do your research. I cannot thank Healthy Paws enough for being there for our dog Kiki and my family when we need them. Kiki was diagnosed with Cushing syndrome and had a mass in her adrenal gland. Kiki underwent surgery to take out the mass which turned out to be cancerous. unfortunately, Kiki developed pancreatitis and kidney failure a couple of weeks later and was hospitalized several times. She lost appetite and lost a lot of weight and had to have a feeding tube inserted in her neck in order to help her get better. While we worried about Kiki’s health, we are thankful that we have a pet insurance to take care of the financial side. Whenever I see or talk to people and coworkers who have pets, I advocate that they get pet insurance for the sake of their pet and themselves. I encouraged my sister, my son and other friends to get Healthy Paws pet insurance and they thanked me because Healthy Paws was there for them as well in time of their need. As for me, Kiki’s medical expenses are over $10,000.00 now. Healthy paws processed our claims always immediately. their Customer Care even reached out to check on Kiki’s condition. Is that GREAT or what? Thank you, Health Paws for being there for us. You are the GREATEST! I have had several dogs in my life. My last dog costs me a bundle in vet bills. So for my next dog, I wanted a pet insurance with generous coverage, one that is affordable, and one that was convenient. I narrowed my choices to FIgo and Healthy Paws. Both were similiar however, if you closely, FIgo offered more. FIgo covered vet exam fees, holistic and alternative medicine, shorter waiting periods, and overall more convenience. The major convenience with Figo is that with FIgo you can text them if you had a question, and they would reply back in minutes. Furthermore, although both FIgo and Healthy Paws had phone apps, Figo phone apps covered more than just claims processing. Best of all, Figo was a bit more affordable. So far, so good. I filed 3 three claims. The first claim took about 8 days, but the second and third claims with processed in less than 6 days. Figo should be ranked soon.. Figo has what I wanted: Generous Coverage, Phone App that covered paperless processing, Affordablility, and Exceptional Customer Serivice. I am glad I chose Figo. Figo although unranked i think beat the top 3 ranked here for exceptional coverage. Hope Figo is ranked soon. Figo’s premiums in my area were higher than Trupanions and Healthy Paws and they wanted an additional $8 per month to cover exam fees. Pets Best does not cover pregnancy or anything to do with breeding. Out of curiosity, why wasn’t Nationwide Whole Pet with Wellness reviewed? It appears all levels of other company plans were included, but the only plan shown to be offered by Nationwide is their Major Medical… which is a stupid plan, but their Whole Pet with Wellness is significantly more comprehensive than the 3 top plans mentioned and is competitive in price. One of our dogs was diagnosed with a chronic condition and they’ve paid for her prescription diet, her meds, acupuncture for pain and all of her medical care, including office visits, CAT scans, ultrasound and xrays. They covered our other dog’s laproscopic spay and a dental with nine extractions on the pug mix we inherited. Is this an independent review or was it sponsored by any of the insurance companies? I ask because all of these reviews promote the top three, but only review Nationwide’s Major Medical. We would have had to euthanize our dog, who is now doing very well, if it weren’t for this plan and I find it disappointing none of the reviews ever mentions it. Our monthly cost for these plans ranges from $58 to $109 a month based on the age of our dogs at sign up. We’ve used this plan for all 9 of our family dogs since spring 2016 when we switched them to this from Trupanion. We’ve had a LOT of claims, I process at least 1 to 2 claims a month on one dog or another, and so far none have been turned down. They do take longer to pay out, more like 2 to 3 weeks before you get the check, longer for extensive medical bills, but that’s not a bad trade off for the extensiveness of the coverage. They also won’t insure puppies on this plan, they have to be 1 year of age, a recent change… but other than that we’ve been pretty happy with the coverage. They pay on virtually no claims. The amount they take out is ridiculous, and you have to fight with them on every claim. Eventually they give and reverse decision if you threaten to cancel, but that is about the best way to get them to do what they advertise. I’m also looking to replace PetPlan because of the price jump. I found when getting online quotes for my 3 pets, that your top pick Healthy Paws has a downside that is a deal-breaker for me. My 10-year-old cat (who is in perfect health) is only eligible for a plan that covers 60% (instead of 80%) and has a $750 annual deductible! You might want to mention that, and not just that they require a checkup for older pets 30 days prior (which wouldn’t be a problem). Also, I noticed in your coverage comparison that Trupanion is checked for covering alternative therapies, but that’s only if you pay an addition fee. I’m considering Pets Best, but still undecided. How should I contact you for help in choosing a pet insurance provider? We typically help people through our comments and just go back and forth like we are here. That way our readers can read it as well and it may help them choose a company too. If you’d rather discuss via email, you can reach out through our contact form and ask specifically to speak with me, Kimberly. How often do you guys update your pet insurance reviews? Will new rankings be coming out Jan 1 2018? Great question Patrick. We re-evaluate pet insurance quarterly and make any ranking updates we see fit. Sometimes there are no changes to the content. We can’t guarantee a ranking change but we can guarantee that the rankings that are live in this article are the most current rankings we have. Please let me know if you have any other questions! Thank you for this in-depth article! You’ve helped me pick out the best policy for my fur baby. Happy we could help you Amy! It would be interesting to know how much the plans go up every year or which company is worse about price hikes . How much do these plans go up after your dog reaches older age? What companies offer the option to pay annually or pay annually for a discount? How long have these company been in buisness? There is no guarantee on how much premiums will increase year to year because it varies by pet. We’d love to analyze this, but there is not concrete information that we have access to. We are not aware of any of these companies offering a discount for paying annually. Some of these companies charge a transaction fee, so by paying annually you would reduce the number of times you would pay the transaction fee. This is something we are in the process of adding to our Pet Insurance Quotes page. You can find the years these companies were founded if you scroll down to the heading “The Rest of the Pack” in this article. Thank you for this excellent summary. There is a lot of information on pet insurance on the internet and putting it all together as you have done is very helpful. The summary of benefits, the analysis of pros and cons, and the comments from users are all excellent features. Following Petplans recent 100% increase of premiums for my two 10-year old dogs I wanted to switch insurance companies if possible and your article helped me to quickly assess my options and make a decision. And I appreciate the 10% discount on Healthy Paws I was able to receive by signing up through your website! Thank you, thank you! So glad we could help you Carlos. Thank you for the kind words. Trupanion looks for ways to deny or chsrge deductibles on every claim. Your dog can have cancer and yet it will keep charging deductibles as different diagnosis if your animal has 2 or 3 different types even when continuing carevis the sane for all (continuing chemo or holistic rx or radiation for example). They want to not reimburse you. Another con for PetPlan is its systems security. Even when not requested, the PetPlan system sends to customers e-mail messages that contain their usernames and passwords in clear text, i.e. unencrypted. In addition, PetPlan customer service representatives have access to and can view customers’ account passwords, which conflicts with standard security practices. The practical implication is an unauthorized person could gain access to information about you and your pet. Fortunately, PetPlan does not store customers’ charge card information in the My Account section. Hi Maldav, we’ve made necessary changes to no longer allow for usernames and passwords to be passed via email in clear text. Your concerns were valid and we listened. Healthy Paws is not all-inclusive as they advertise. Pay close attention to the fine print. My dog had a knee injury 11 days into the policy and Healthy Paws wouldn’t cover any of it because the 15-day waiting period had not yet ended. Even though he had surgery after the waiting period, they wouldn’t cover it because “clinical signs or symptoms of the condition treated were noted in his medical records as being present during the waiting period”. They wouldn’t even cover the consultation because they don’t cover that either. They only cover the cost of the veterinary treatment (not the cost of the vet consult or anything other than the actual “treatment”) “related to an accident, illness or injury where the clinical signs or symptoms were first present after the enrollment date and waiting periods”. They require you to submit all previous vet records including doctor’s notes from birth to present. If there is any sign whatsoever that your pet had the problem before the policy, they will not cover it. And if they do, they only cover a part of it. Don’t waste your money and jump through hoops, like I did, for nothing. Thanks for sharing your experience with Healthy Paws! Unfortunately, most insurance companies have waiting periods (some longer than others). Were you able to find another pet insurance company to go with? I won’t be able to use any other insurance company now that Healthy Paws has deemed my pup’s injury as pre-existing. Now I’m screwed for anything relating to his knee for his entire life. This whole experience has turned me off to pet insurance, period. Mother Sunshine, I just read a YELP review for Figo, and there’s a lady on there named Ashley singing its praises about its pre-existing condition clause. She has an older dog who has already had $12,000 worth of knee injury repair. So she too had a hard time finding the right insurance. Here’s an excerpt: “I chose Figo because if your pet doesn’t show any signs or symptoms or anything for 12 months after the last surgery on the knees were performed, then any injuries to that area will be covered again!” Please read the full YELP review and look into it for the sake of your dog. You might be pleasantly surprised! Also, I’d love to hear back from you regarding your experience. I hope all works out great for you and your pup! USAA does not offer their own pet insurance, they simply offer an up to 15% discount with Embrace to USAA members. Thank you for the information! The information we found was rather confusing for USAA but this helps clear it up some. Thanks again!